Some stories are simply hard to swallow. In the case of Jeffrey Dahmer, that is the truth. Telling the near to true life tale of the fetishistic serial killer's teen years, this portrait of social awkwardness and the callousness of the world is a vital piece of revisionist history that lets us see inside the growing mind of one of the most notorious murderers. Showing Dahmer as a troubled youth that had a hard time fitting in definitely makes us want to sympathize with him, although it's hard to do when you know the outcome. Based on the graphic novel (which I never read), this was a hard watch for me. On the first viewing, I needed to shut it off due to themes that related to testing on animals. Still, I persisted. The second time was not nearly as stomach churning. Filmed using an extremely flat cinematic style that doesn't glorify Dahmer, but instead just gives us an inside look at his character and the days that lead up to his killing spree, director Marc Meyers takes full control, steering the material with a sleight of hand. My Friend Dahmer doesn't celebrate or amplify what happened. Meyers actually makes a film that's reliant on strong acting that's rooted in a script that partially humanizes each player without trying to convince us that we should feel any empathy for Dahmer, his mom, or the terrible and manipulative people around him. Meyers states his narrative, and then moves on. 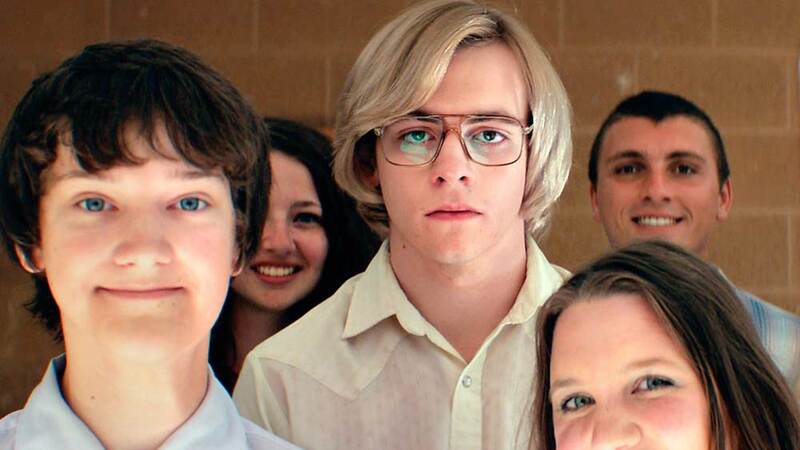 With other movies about true crime attempting to cash in by lionizing criminals, My Friend Dahmer is an exercise in how a director can stay reserved with such distressing content. Other than scenes of dead animals in jars, Jeff's weird nature, and some mild tension, Meyers plays it safe. That's probably a good thing. At the core of the film lies a great performance from actor Ross Lynch. Remaining placid but on the edge of a psychotic break for the entirety of the movie, Ross captures a teenager that just wants to be friends. He attempts to fit in with the popular kids, finds some hope, but is eventually dashed as he shows signs of cracking. When things start to fall apart, Meyers gives us glimpses of what's to come, remaining stalwart in his decision making process. Sadly though, some of the scripting doesn't allow for too much background for Dahmer. His parental struggles are often times glanced over, with Anne Heche once again playing a damaged central character. We get that there were problems at home. We see how the disconnect and psychological issues on the home front definitely were a causation in his later years. Unfortunately, this is the one plot point that would have made more sense to focus on. Jeff's life wasn't easy, but details that are missing from the scope of the movie should have been filled out, if only just a little bit more. My Friend Dahmer is an interesting piece of cinema. It's a cold movie with a barren outlook that looks inside the mind of a psycho. As a fan of true crime and someone that's studied numerous serial killers, this is about a straight as they come. 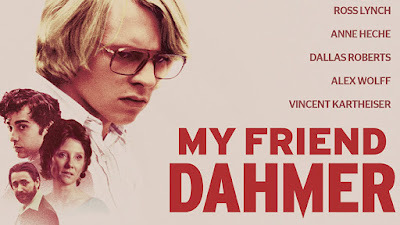 What could have been an over cooked piece that revels in violence in bloodshed, this plays more like an art film that just so happens to be about Jeff Dahmer. And that's okay. It may not be the best study I've seen, but it's at bare minimum, a watch that might not entertain but will give you insight into how the human mind can be molded.